Every new parent finds giving a bath to their newborn a challenging experience. Parents want to do their best to keep their baby clean and germ-free. Now, you can gear up with the right bath accessories to make your little one’s bath time as fun and simple as possible. The good news is that you do not need to spend a fortune to enhance this experience of togetherness with your child. Experienced moms will assure you that there are towels and bath cloths made especially for babies that offer the softest touch while wiping and cleaning them with care. Get the best baby towels ready that instantly offer gentle warmth right after a bath. Towels today come in multiple brands and options. Here are our best picks of towels and bath cloths that you can trust to keep your baby squeaky clean at all times. 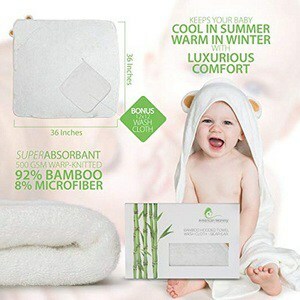 If you want to make cleansing a comforting experience for your child, then choose this organic baby towel. This super absorbent cloth has nontoxic dyes and is made up of antibacterial bamboo fiber that protects the child’s skin and makes your baby smile at clean up times. Read on to know more about one of the best baby washcloths available in the market today. Backed by 100% lifetime guarantee, the super soft but thick material makes it sturdy, easy to use and works up a lather quickly during bath time for your baby. Essential for long distance travel with babies to keep them clean. Apart from being used for cleaning your baby, you can use this cloth as a hand towel for facial cleansing and makeup removal. It is slightly more expensive than regular towels. This organic washcloth is an ideal baby shower gift. As a mother you want to be the caregiver for your baby and this premium product will certainly help you deal with any cleanup situations. Looking for a multipurpose towel to care for your newborn or toddler? This thick and soft towel offers luxurious comfort. Your baby stays warm in winter and cool in summer. You can even wash the towel in the washing machine. 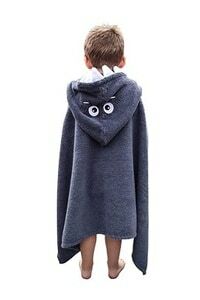 This baby hooded towel is 100% safe and hypoallergenic. It supports your little ones good health as it resists odors and doesn’t irritate your baby’s sensitive skin. Its soft, breathable fabric gives UV protection. This value-packed set comes with a free baby washcloth. It comes with a 100% money back guarantee – making it a risk-free purchase. Excessive chopping of old bamboo trees, as well as the chemical process involved in making bamboo towels, is not good for the environment. Hooded towels make your baby more adorable and regulate the body temperature by getting them dry and warm instantly after a bath. No wonder discerning mothers trust these towels. Toddlers and preschoolers love towels with animals or other such cute designs. They are more excited about bath-time if they have a towel with their favorite character on it. You can pick a towel from the vast range of hooded bath towels for toddlers available today for the perfect end to a soothing bath. The shark face design adds to the fun factor whenever for a swim or a beach holiday. The thick, soft and natural cotton material is free from harmful chemicals or pesticides. 30-day refund guarantee, in case you are not happy with this product. Traditional cotton towels suffer damage more easily than towels made from bamboo fabric. Cotton towels are prone to shrinking when left to dry. This exclusive and fashionable towel is gentle on your child’s delicate skin. Its large size is tailored with soft stitching. This makes a unique gift for a child of any age. This cute product comes with a lovely bow making it a perfect gift to a newborn baby girl. This super soft, extra absorbent and machine washable towel is one of the best baby bath towels you can find. Made with premium breathable and quick dry cotton. The extra-large size makes it easy to use. Cotton towels are more affordable. 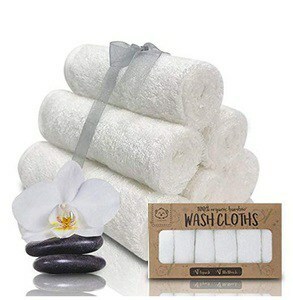 You can always choose Bamboo fabric towels that are more eco-friendly. This product with its fun 3D design of an elephant can make your kid look super adorable. Its soft fabric maximizes comfort for the little fashionista. Looking for the best baby towel available in the market? 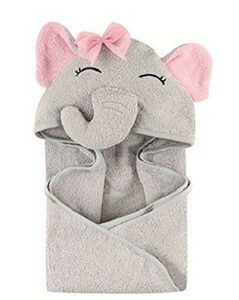 Treat your baby to this plush and thick towel that offers a gentle touch. Made of 600 GSM organic Bamboo Fibre, the towel is incredibly soft, durable and dense. Its antibacterial and hypoallergenic characteristics make it a safe and healthy choice. It’s hanging loop makes it easy to dry. Its extra-large and gender-neutral design make it a safe buy. As this hooded towel comes with a timeless bear design, and a free bib, it can be a great gift for a birthday, baby shower or any special occasion. Not all bamboo fiber products in the market live up to your standards. Every purchase of this product allows to contribution towards World Vision Charity Organization, besides giving your child the best experience. The antibacterial feature is an added advantage. Choose wisely after considering the quality, functionality, and designs of towels before buying them for your little one. Instead of soap, switch to using a soft washcloth that best suits your child’s skin. Towels and washcloths are handy for the upkeep of hygiene even during meal times, spit-up scenarios and diaper changes. Babies catch colds easily as their immune system is weak. These washcloths and towels will help keep your baby dry, warm and safe.